Once Ravana is going to river Narmada to challenge with Arjuna to measure his strength. But captured by Arjuna there? Why did Arjuna capture Ravana? I eager to know the full story behind their war. Finally how could Ravana able to save himself​ from Arjuna? This Arjuna was a king of Maheshmati from Haihayas (a branch of Yadavas). He was son of Kritavirya hence famously known as Kartavirya Arjuna. He is also known as Sahasrabahu Arjuna or SahasraArjuna. He is believed to be an incarnation of Sudarshana Chakra. He got boon from Lord Dattatreya which made him so powerful. Kartavirya Arjuna eventually met his death at the hands of Lord Parashurama. Story of Kartavirya Arjuna can be found in Valmiki Ramayana, Mahabharata and various Puranas. Why did Arjuna capture Ravan? Ravana challenged him for the war when he was enjoying Jala-Vihar in Naramda river. Later Arjuna defeated Ravana and captured him. I eager to know the full story behind their war? At no distance from where on the banks of tbe river Narmada, that dreadful lord of Rakshasas collected the flowers, Arjuna, the King of Mahishmati, and the foremost of the victorous, was sporting with his wives in the water And being encircled by them the king Arjuna appearo like a leading elephant surrounded by a thousands of she elephants. In order to measure the strength of his thousand arms the King of Haihayas obstructed the course Narmada. Being obstructed by the arms of Kartavirjarjuna and having looded the banks with her pure waters, Narmada lowed in an opposite direction. And the currents, rising high as duringrainy seasonlowed with fishes, and crocodiles. And that stream, as if driven against Ravana by Kartavirjarjuna, carried away his collection of flowers. And having given up his worship which was half finished Ravana looked towards Narmada looking like an unwilling damsel and saw that she, with rising currents, was flowing towards the east from the west and the waters beyond that were in a natural state like a quiet lady and the birds were seated there without any anxiety. Thereupon being anxious to learn the cause of the rise of the river, the Dasagriva, with his right finger, hinted Suka and Sarana. Being commanded by Ravana, the two brothers, the heroic Suka and Sarana proceeded towards the west by the aerial way. And going half a league, the two night rangers espied a man sporting in the waters with some females. He was huge as a Sala tree, his hairs were floating on the water, he was inebriete and his eyes were reddened in consequence thereof. Like unto Sumeru holding the earth with his thousand feet he obstructed the current of the river with his thousand arms. And he was surrounded by a thousands of beautiful damsels like an elephant by a thousands of she elephants. Beholding that dreadful spectacle, the Rakshasas Suka and Sarana came back and approaching Ravana communicated (all) unto him. "O lord of Rakshasas, an unknown person, huge as a Sala tree, is sporting with females obstructing the course of Narmada like unto a dam. And being withheld by the thousand arms of that man the waters of Narmada were continually throwing up high waves." Hearing the words of Suka and Sarana, Ravana exclaimed "This is Arjuna" and proceeded to fight with him. Ravana, the lord of Rakshasas, having set out with a hostile intention against Kartavirjarjuna, the wind mixed with dust began to blow high with tumultuous sound. And the clouds began to mutter with a downpour of rain. And the lord of Rakshasas proceeded against Arjuna with Mahodara, Mahaparshva, Dhrumakshya, Suka and Sarana. Within a short time the dreadful Rakshasa, powerful as the elephant Arjuna, reached the banks of Narmada and espied there Arjuna encircled by females as an elephant surrounded by she elephants. At the very sight the eyes of the lord pf Rakshasas, proud of his prowess, grew red and addressing the councillors of the king Arjuna he said "Do ye communicate unto the king of Haihayas that Ravana, the lord of Rakshasas, hath come to fight with him." Heaing the words of Ravana, the ministers of Arjuna stood up with arms and said "O good Ravana, thou art well cognizant Of the proper time for fighting. Now our king is drunk and is sporting with the females in the waters. And now dost thou wish to fight with him. Therefore, O Dasagriva, do thou spend the night here, if thou art bent upon fighting. Or even if thou art anxious to enter speedily into conflict with Arjuna do thou slay us all at first, and then fight with the king. Thereupon the hungry councillors of Ravana, slew some of the ministers of the king and devoured some. There arose a dreadful uproar on the banks of Narmada, of the councillors of Ravana and Arjuna. The warriors of Arjuna assailed Ravana and his ministers with hundreds of arrows, Pracas, darts, Tomaras, thunder bolts and Karpanas. The warriors of Arjuna became dreadfully furious and emitted cies like the roaring of the deep infested with crocodiles, fishes and other marine monsters. Thereupon being enraged and displaying their own prowess Suka, Sarana and other ministers of Ravana began to destroy Arjuna s soldiers. Thereupon the emissaries, stricken with fear, went to the sporting king and communicated unto him the proceedings of Ravana and his ministers. Hearing those words and saying unto the females "Do not fear"he rose up from the waters like an elephant. The eyes of that fire like Arjuna were reddened with fire and he shone dreadfully like the fire of dissolution. And taking up speedily his club, that one, always using golden clubs, pursued the Rakshasas like unto darkness following the sun. Holding up the huge club and hurling it with his arms, Arjuna, resorting to the velocity of Garuda. went on. Thereupon stood there obstructing his course Rakshasa, worked up with anger and with a mace in his hand, like unto the Vindhya range standing in the way of the sun. And throwing down of his hand the iron mace, he, in anger, began to roar, like Yama. And the top of the mace was ablaze like the tips of Asoka flowers. Not the least agitated on beholding that mace, the king Arjuna, by his club, bafled its action. Thereupon uplifting the huge club, ive hundred hands long, the king of Haihayas pursued Prahasta. And within a shot time being struck down by that club gifted with great velocity Prahasta fell down on earth like unto the summit of a mountain clapped down by the thunder bolt of Indra. Beholding Prahasta fallen, Maricha, Suka, Sarana, Mahodara and Dhrumakshya led away from the battle field. All the councillors having thus led away and Prahasta bemg slain Ravana speedily proceeded towards Arjuna, the foremost of kings. Thereupon there ensued a terrible encounter capable of making down erect between the thousand armed Arjuna, the king of men, and the twenty armed Ravana, the king of Rakshasas, And taking up their clubs Arjuna and Ravana began to ight with one another emitting cries like the mutterings of clouds, like unto two huge bulls fighting for a cow, two agitated oceans, two moving mountains, two effulgent Adityas, two burning flames, two proud elephants, two proud lions and like the very Rudra and Kala. As the mountains sufer many clappings of thunder bolts so did they bear many strokes. And all the quarters were resounded with the sound proceeding from the stroke of their clubs like unto the sound of thunder bolts. Being placed against the breast of Ravana Arjuna s club rendered, for a moment.the welkin look like the burning gold as does the lightning. And striking again and again against Arjuna s breast Ravana s club looked hke a huge fire brand. Arjuna was not worn out nor was Ravana. And the conflict went on between them like the encounter between Bala and Vasava in the days of yore. The King of men and the King of Rakshasas battled and wounded one another with their clubs like unto the bulls stiking one another with their horns and like two elephants with their tusks. Thereuponworked up with rage, Arjuna, with his full might, smote Ravana with his club. But Ravana was well protected by the boon of the celestial, so the club fell down to earth sundered into two pieces like one hurled by a poor wight. Still wounded by the the mace of Arjuna, Ravana, after hiding tears, ran away at a distance of four feet and stood there. Beholding Ravana thus overwhelmed, Arjuna sprung up and caught him like Garuda holding a serpant and Vishnu binding Bali. Dasagriva being thus bonded the Siddhas, Charanas and the Devas exclaimed, "Well done! Well done !! "showered flowers upon Arjuna. Then the king emitted leonine roars agnain and again like a tiger joyous like a cloud, hodling a deer under its grasp. Regaining his senses and beholding Ravana bound, Prahasta, in great anger, pursued, king of Haihaya. And the Rakshasa orce grew tempestous like unto the rising of the ocean during rains. Thereupon exclaiming repeatedly "Leave him off! Leave him off!! Wait! Wait!!" The Rakshasa host hurled hundreds of Musalas and darts in the battle field. Not the least moved thereby the king Arjuna, the slayer of enemies, bore those weapons of the enemies of the Devas. Thereupon baffling the weapons of the Rakshasas by means of many a dreadful and excellentweapons, Arjuna, the king of Haihayas, drove them away like winds scatteing the clouds. Having thus struck terror unto to night rangers, he, encircled by his own kinsmen, repaired to his own city with Ravana. carrying him bound like unto Indra carrying Bali bound. Thereupon flowers and fried paddy were showerfd upon him by the Brahmanas and citizens. Therupon Pulastya heard from the Devas of the capture of Ravana like unto the holding of the wind. And having been moved by the love for his (grand) son, the highly effulgent, great ascetic, proceeded to see the king of Mahishmati. Proceeding by the aerial way, that twice born one, gifted with the velocity of wind and the flight of mind, reached the city of Mahishmati. Thou hast bound up my invincible (grand) son in the conflict at whose fear the wind and the ocean stand still. The king name is Arjuna. As he was the son of the king Krritavirya, he was also famously known as Kartivirya. He is the ruler of Haihayas with Mahishmathi as the capital. He had thousand arms. This king was killed by Parashurama. 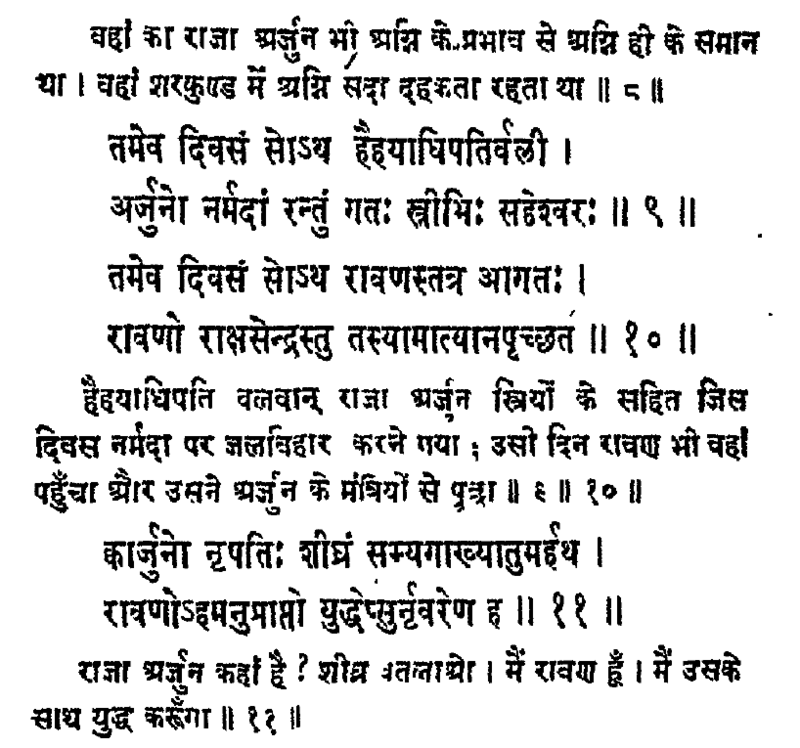 The lineage and story of Kartavirya Arjuna is given in this chapter of Vishnu Purana. Yadu had four sons, Sahasrajit, Krosht́i, Nala, and Raghu 2. Śatajit was the son of the elder of these, and he had three sons, Haihaya, Veńu 3, and Haya. 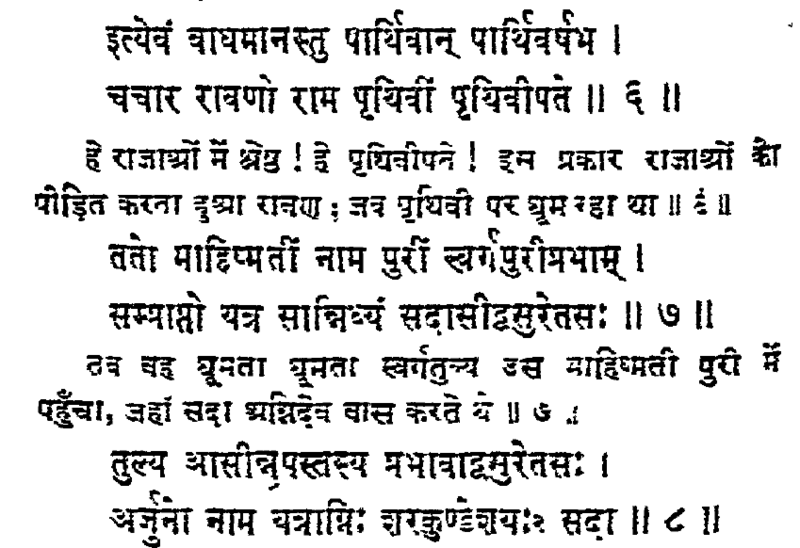 The son of Haihaya was Dharmanetra 4; his son was Kuntí 5; his son was Sáhanji 6; his son was Mahishmati his son was Bhadrasena 8; his son was Durdama; his son was Dhanaka who had four sons, Kritavíryya, Kritágni, Kritavarman, and Kritaujas. Kritavíryya's son was Arjuna, the sovereign of the seven Dwípas, the lord of a thousand arms. He propitiated lord Dattatreya and got following boons. A thousand arms; never acting unjustly; subjugation of the world by justice, and protecting it equitably; victory over his enemies; and death by the hands of a person renowned in the three regions of the universe. 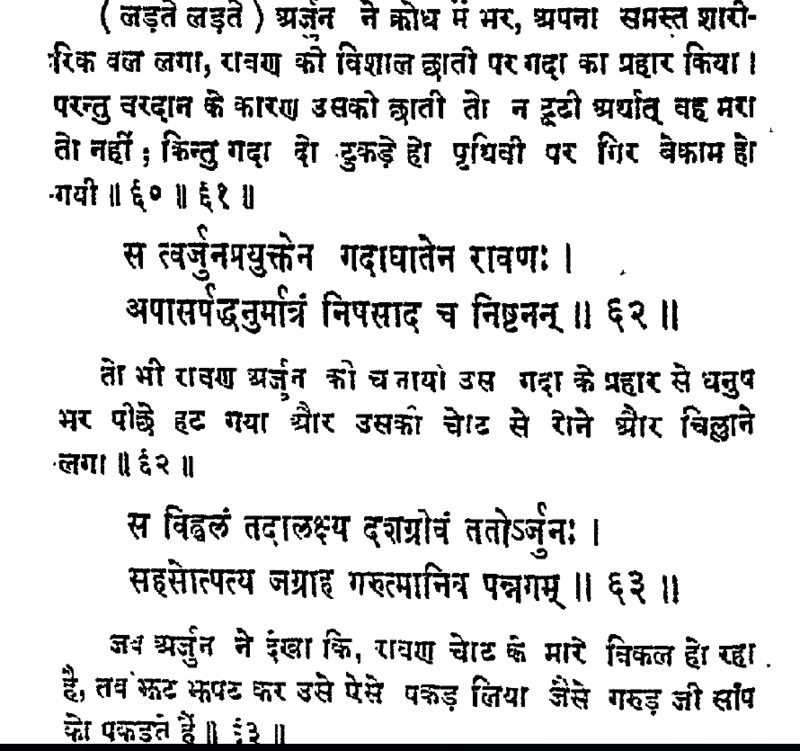 The story of war between him and Ravana is given in detail in the Uttara Kanda of Valmiki Ramayana. Once, Arjuna came to Narmada River sporting with his wives. The same day, Ravana also came to there and asked his counselors where was his king with a wish of fighting and defeating him in a battle. The counselors said him about their King's absence. After hearing them, Ravana proceeded to the banks of Narmada river. Pleased by the beauty of the Narmada river, he and his ministers descended into the waters of Narmada. After getting out, he worshipped the Golden Shiva Linga which was with him wherever he went. He worshipped Shiva Linga with various flowers. "O lord of Rakshasas, an unknown person, huge as a Sala tree, is sporting with females obstructing the course of Narmada like unto a dam. And being withheld by the thousand arms of that man the waters of Narmada were continually throwing up high waves." At the very sight the eyes of the lord pf Rakshasas, proud of his prowess, grew red and addressing the councillors of the king Arjuna he said "Do ye communicate unto the king of Haihayas that Ravana, the lord of Rakshasas, hath come to fight with him." O good Ravana, thou art well cognizant Of the proper time for fighting. Now our king is drunk and is sporting with the females in the waters. And now dost thou wish to fight with him. Therefore, O Dasagriva, do thou spend the night here, if thou art bent upon fighting. Or even if thou art anxious to enter speedily into conflict with Arjuna do thou slay us all at first, and then fight with the king. Thereupon, the followers of Ravana slew up the soldiers of Arjuna and ate them and some killed the ministers of his. 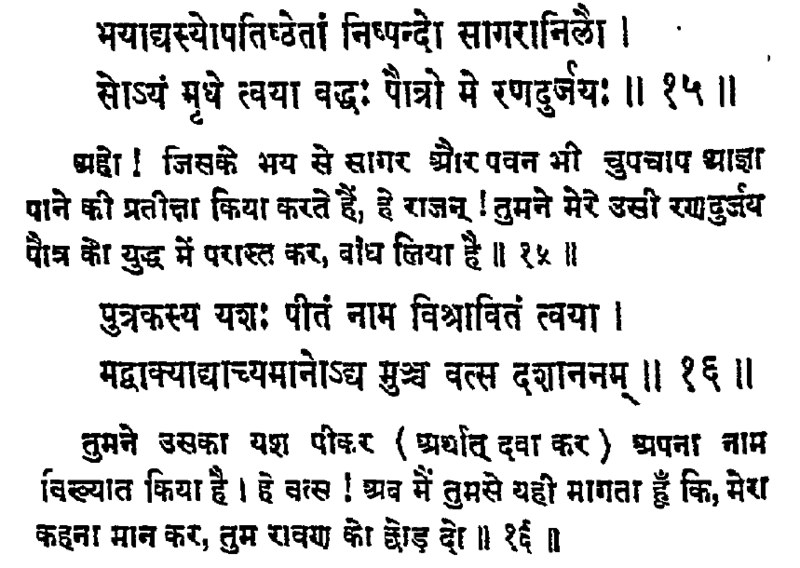 Here is the combat between Ravana and Kartavirya Arjuna which is an excerpt of 37th chapter of Uttara Kanda. Throwing down of his hand the iron mace, he, in anger, began to roar, like Yama. And the top of the mace was ablaze like the tips of Asoka flowers. Not the least agitated on beholding that mace, the king Arjuna, by his club, bafled its action. All the councillors having thus led away and Prahasta being slain Ravana speedily proceeded towards Arjuna, the foremost of kings. Thereupon there ensued a terrible encounter capable of making down erect between the thousand armed Arjuna, the king of men, and the twenty armed Ravana, the king of Rakshasas, And taking up their clubs Arjuna and Ravana began to fight with one another emitting cries like the mutterings of clouds, like unto two huge bulls fighting for a cow, two agitated oceans, two moving mountains, two effulgent Adityas, two burning flames, two proud elephants, two proud lions and like the very Rudra and Kala. As the mountains suffer many clappings of thunder bolts so did they bear many strokes. The King of men and the King of Rakshasas battled and wounded one another with their clubs like unto the bulls stiking one another with their horns and like two elephants with their tusks. Thereupon worked up with rage, Arjuna, with his full might, smote Ravana with his club. But Ravana was well protected by the boon of the celestial, so the club fell down to earth sundered into two pieces like one hurled by a poor wight. Then the king emitted leonine roars again and again like a tiger joyous like a cloud, hodling a deer under its grasp. Regaining his senses and beholding Ravana bound, Prahasta, in great anger, pursued, king of Haihaya. And the Rakshasa once grew tempestous like unto the rising of the ocean during rains. Thereupon exclaiming repeatedly "Leave him off! Leave him off!! Wait! Wait!!" The Rakshasa host hurled hundreds of Musalas and darts in the battle field. Not the least moved thereby the king Arjuna, the slayer of enemies, bore those weapons of the enemies of the Devas. Thereupon baffling the weapons of the Rakshasas by means of many a dreadful and excellent weapons, Arjuna, the king of Haihayas, drove them away like winds scattering the clouds. Having thus struck terror unto to night rangers, he, encircled by his own kinsmen, repaired to his own city with Ravana. carrying him bound like unto Indra carrying Bali bound. Thereupon flowers and fried paddy were showered upon him by the Brahmanas and citizens. Ravana was later released by the King Kartavirya Arjuna due to request of Ravana's grandfather sage Pulastya. as explained in the very next chapter of Uttara Kanda. As stated in other answers this arjuna was Kartaviryarjuna the other name of whom is also SahastraBahu Arjuna.He was son of Krutavirya and he obtained asta siddhi's from lord Dattatraya. The Story of Kartaviryarjuna OR SahastraBahu Arjuna and Ravana is also can be found in Skandha 9 -Chapter 15 of Shreemad Bhagvat Purana. 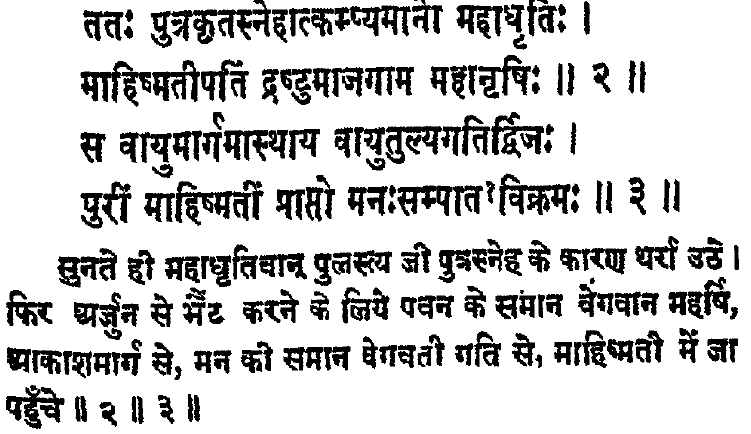 According to the purana Once Kartaviryarjuna was enjoying in the waters of the river Narmad. At that time he , by his powers stopped the flow of Narmada. Then river started to flow in reverse direction due to this action. Ravana was clamping nearby the Narmada river at time time was furious by knowing this. 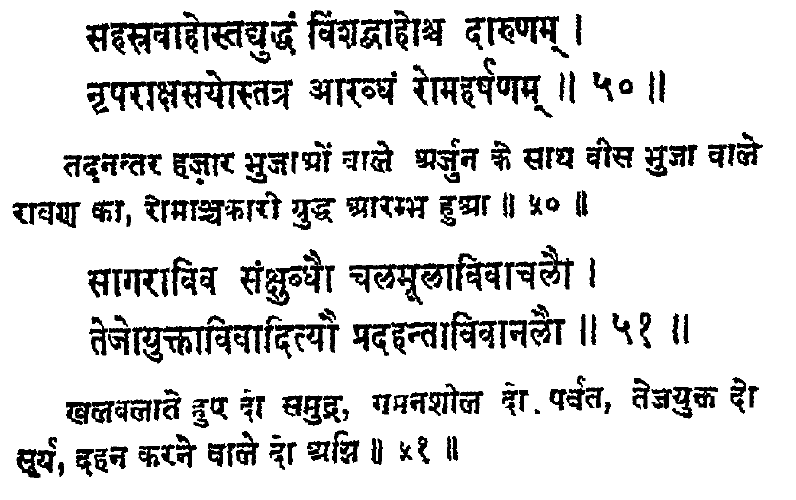 Kartaviryarjuna arrested and captured Ravana and took him to city of Mahismati and later on saying of Rishi Pulastya released him. Not the answer you're looking for? Browse other questions tagged mythology ramayana ravana . What happened to the Pushpak chariot taken by lord Rama? What does the story “Gajendra Moksha” depict?